Classified 4 stars in the furnished tourism of the city of Avignon, the cottage is in the countryside but close to the city center (4.5 km). It consists of an open kitchen fully equipped. On the ground floor and upstairs, a bedroom with its bathroom and toilet. The upper bedroom has a seating area and opens onto a roof terrace with views of the countryside. You will be able to park your vehicle without problems. IMPORTANT NOTE: The reservation must be made at least 48 hours in advance. Otherwise it will not be validated. Chantal and Gaby have a very nice apartment on the outskirts of Avignon. It is very well-located both to get into the old section "inside the walls" of Avignon and only a few minutes drive to the A7 which gets you to just about anyplace else you want to explore. They are great folks and really care about you and your stay in the Avignon area. The pictures and descriptions are all reliable and you will really enjoy your time here. Merci beaucoup pour votre appréciation !! !C'est avec grand plaisir que nous vous recevrons à nouveau. One of our best ever stays! 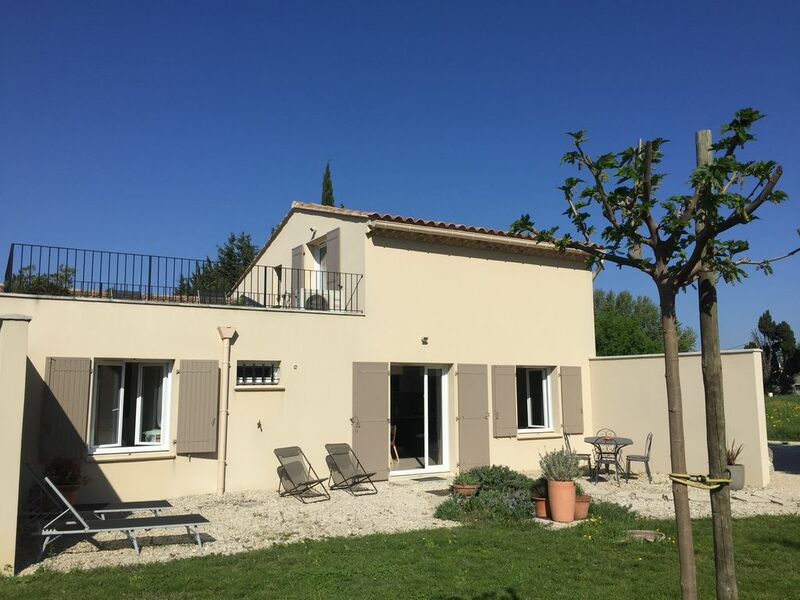 The lovely little house is located in a semi-rural area on the edge of Avignon. A car is needed, but it is only a 10 - 15 minute drive to an enormous free parking lot which has a frequent free shuttle into the heart of Avignon. A larger supermarket is less than a 10 minute drive. The house was perfect for two couples. One bedroom with full bath is located on the main floor and separate from the common area, The other, second floor, bedroom is very large, has a full bath and a walk out to a large balcony. The negative for some might be the rather steep, open stairs to reach it. The living/dining/kitchen area is also large and nicely furnished. The kitchen is exceptionally well supplied, and there is a large washing maching and dryer. Everything is in perfect working order. Chantel, the landlord, lives next door, and she or a member of her family are easily available if necessary. We wished our travel plans had allowed us to stay longer. We had a wonderful stay in this villa. Chantal was very welcoming and considerate about the needs of her guests. Her thoughtful touches, such as the home-made jam, juice, fresh flowers and useful information about the local area were much appreciated. The villa is immaculately clean with a new and fresh feel to it. It has two spacious bathrooms, a contemporary kitchen and a great roof terrace that was terrific for star gazing! It’s very well-equipped with lovely attention to detail in terms of comfort and relaxation, including basic kitchen provisions (eg cooking oils, condiments and cleaning products), books for children, board games and table tennis. It is conveniently located for Avignon, nearby shops and supermarkets, and a good base for exploring the sites of Provence. Highly recommended! Je suis très touchée par votre appréciation ! C'est avec grand plaisir que je vous ai reçu. Very pleasant stay in Avignon. Quality location, great layout, comfortable, impeccably clean, modern and incredibly friendly and accommodating hosts. Excellent choice and highly recommended! Chantal's rental is a very nice place to stay and I highly recommend it. You will not be disappointed. Conveniently located just outside of Avignon for those with an automobile, it is clean and new. Bathrooms are nice and the kitchen is modern and well equipped with everything you will need. This is a nice quiet location with a very rural feel, but is just outside of the city. It has two good sized bedrooms and two bathrooms. A large, modern supermarket is not far away. We would most definitely stay there again. The only consideration is that the second bedroom and bath are on the second floor and require using a steep spiral staircase. This was not a problem for our group, but if mobility is an issue, this should be considered. Also, my Garmin GPS could not locate her address. I had to find it using Google Earth and then zoom in on my GPS unit and touch the screen to select her location in order to set it as a saved place in my GPS. I would do this at home before leaving on the trip, or print a detailed zoomed in map of her neighborhood area to take with me to find her exact lane if you use a rental car GPS. Je suis vraiment désolée que vous ayez eu des difficultés à trouver le gite ! En espérant vous voir une prochaine fois ! CAUTION REMBOURSABLE DE 400 EUROS A VERSER A L’ARRIVÉE . Dans le tarif est compris : - le linge de maison complet (draps, serviettes de bain, tapis de bain, torchons) - les lits sont faits à votre arrivée - les produits de base pour commencer votre séjour : produits ménagers, papier toilette, sopalin, sacs poubelles. - pour le premier jour : thé , café , sucre - consommation eau, électricité, climatisation, internet.